The end of the summer is wrapping up. Bursts of color are erupting over the mountains as trees, shrubs and other foliage battles the cold nights. I have been learning the secret of the pine cone, and this plant matter will not change, ever. At Custom Iron Design I have learned a tremendous amount of knowledge pertaining to random skills for metal working, similar to the random things learned through life. To much philosophy dumbs down the act of creation. I made pine cones, and lots of them for a pool table chandelier. Additionally, the last artSPOT artwork was installed, capping off the project for my part, however it may continue... I was allowed to demolish and remove the Chevron'ness of the sign, and it was immediatly transformed into a sculpture zone. Think of the possibility of a public art gallery, exhibiting fine art and design for everyone to enjoy. Utopian dreams, but maybe a reality someday. In preparation for a tour in New Zealand I decided to go 'around the block'. 20 minutes into the journey I started up Teton Pass via the old pass road. 15% grades and a loaded touring bike were interesting for my gumby legs, but I made it up fine at barely walking speed. Gotta love the great granny gear, weee. Borrowing gear is splendid. A friend loaned me his bike from a previous Pan Am journey, and I acquired all the panniers from a local non-profit, Friends of Pathways. The director, Tim Young is an interesting and inspiring individual having ridden around the world. I stayed the night at Pallisades, approximately 60 miles into the journey. It was a shock to see the resivouir in its current state at 18% of its capacity. If there isn't a monster snow year coming up, this shallow lake will turn into a babbling brook. The epic vista from the journey wasn't the splendid fields or magnificent color changes occurring, rather it was two moose attempting to ford the Snake River. I happened on this intense moment in the snake river canyon, and witnessed the creatures standing strong in deep waters when the current overcame them. Instinct took over, and both moose avoided the treacherous white water downstream and opted to munch on willows upon exiting the water where they began their journey. 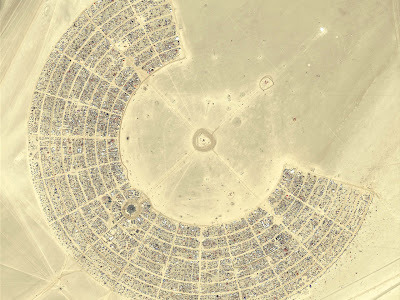 Welcome to the Playa of Black Rock City, home of Burning Man. I am drawn to the event, held in the desert of northern Nevada for the awe inspiring and often interactive large-scale art. I made the promise to myself that this would be the only way I would return and attend another Burning Man - For the purpose of creating sculpture on the Playa, a gigantic open canvas of expression. I was the chief engineer of our shade structure, and what a ride that was. After a group consensus, the structure was plotted out 50% longer than originally planned, increasing the deadly surface area of the sail-like structure. A de-commissioned hot air balloon served as the shade, although it acted as a heat barrier and soon we were baking inside the structure. Vents and multiple layers of fabric were the logical solution...However this had its downfall which was unpredictable by us 'virgins'. Low and behold, Black Rock City is privy to the extreme and unrelenting forces of the desert climate. Far away in the deep playa, on a art appreciaiton journey, a dust storm hit. The air was as thick as black coffee with dust and 50 mph winds, and it was soon painful to open an eye behind sunglasses. Thankfully, we hitched a ride with a hardy art car equipped with a live band on the second story. It serindipidously headed back to its home base, a mere 1/4 mile from our camp. The winds had run amok in our camp, and the vents cut just that morning to relieve us from the heat had bled wind into the structure, ripping and tearing the middle section away. If it wasn't for quick thinking and haggard knife hacking, we might have lost the entire structure. In another endeavor, hammock bikes were fabricated for the playa. We chopped a bike in half, flipping the back and putting it in the front while placing the front in the rear for steering. All in all a chillin ride. All in all the event was a spectacular experience in self reliance and problem solving, mixed in with a deep respect for nature and the 50,000 crazies that convene in the desert to share their energy, projects and company for one week. The image above tells it all, with a formation of planes that departed from the airport in Black Rock City, to display the icon of Burning Man in the sky for all to see.